Annual Practice codes for UK Tier 2 Visa publicized! The Practice codes for UK Tier 2 visa have been publicized on 1st March. It is a yearly updating for employer willing to sponsor non-EU skilled labors. The practice codes are a set of guidelines issued by UK immigration department annually to be followed by the employers if he wishes to sponsor a non-EU skilled immigrant under Tier 2 visa class. These are annual updating and upgrading of attributes of point system such as skill levels, job titles and proper pay. Tier 2 sponsored visa class is meant for worldwide skilled immigrants and applicants can apply under Tier 2 visa class if they satisfy the skill level and possessing prior experience in that particular occupation. Is evaluates candidates qualification for Tier 2 class under a point based system awarding points for different attributes such as age, education, experience and health. Applicants have to score minimum required overall point to get approved for immigrate and work in UK. Employer willing to issue a certificate of sponsorship for a non-EU skilled labor then he must review the latest practice codes which also involve the condition of specific places of job advertisement in UK prior to offer it to a abroad worker. The recent impending permanent cap on Tier 1 visa has laid alone Tier 2 visa class the rest popular choice for employer to accommodate labor demand of UK market. 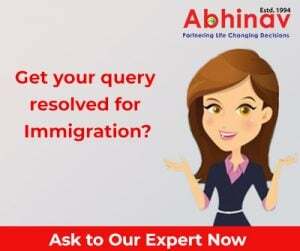 Abhinav immigration is a popular immigration and visa company serving global clients aspiring for UK immigration and rest popular destinations. Abhinav have an ace in Tier 2 visa class and successfully assisting applicants applying under this category. Mail your resume to ajay@abhinav.com for a free of charge assessment. South Australia A Preferred Choice for Indian Immigrants! Children or Family of Principal Applicant(s): Parent Category!